USA Hockey has always been about growing the game. Attracting more youth players every year is always a major goal. And USA Hockey continues to play a significant role in helping member hockey associations do that around the country. USA Hockey’s Andy Gibson, coordinator of program services, had the opportunity to speak at Massachusetts Hockey’s annual Association Leadership Conference in early May to discuss ways the association can continue moving in the right direction. Gibson detailed two major initiatives USA Hockey is promoting with its associations: the 2 and 2 Challenge and Club Excellence. “I always tell people there’s no silver bullet when it comes to growing youth hockey or youth sports in general,” Gibson said, but USA Hockey has had success with the 2 and 2 Challenge, which tries to increase participation in the ages 4-to-8 group, as a blueprint for growth. It uses the goal of acquiring two new players and retaining two additional players from the previous season’s total in the 8-and-under category. There are three specific areas USA Hockey zooms in on with the 2 and 2 Challenge: retention, acquisition and conversion. Retention is the welcome back piece — inviting players to return for the upcoming season. For any 8-and-under player who registered last year, USA Hockey invites them back through an email campaign and a special phone call. USA Hockey works with every American NHL club to organize a 30-second sound bite from one player on every team. Then USA Hockey pushes those calls out to all 8-and-under players who haven’t registered for the season. USA Hockey also provides a list to each association containing the players who haven’t registered yet for an upcoming season. The associations are encouraged to contact those players. USA Hockey also provides a manual on how to handle those conversations with the players’ parents. The acquisition portion of the 2 and 2 Challenge includes the Try Hockey for Free days. This upcoming season’s national dates are Nov. 10 and Feb. 23. The spring date actually falls on the Saturday of Hockey Week Across America, Gibson noted. Conversion is the final component of the 2 and 2 Challenge. These are transitions programs, such as Learn to Skate USA and Learn to Play, that take place not long after Try Hockey for Free days. 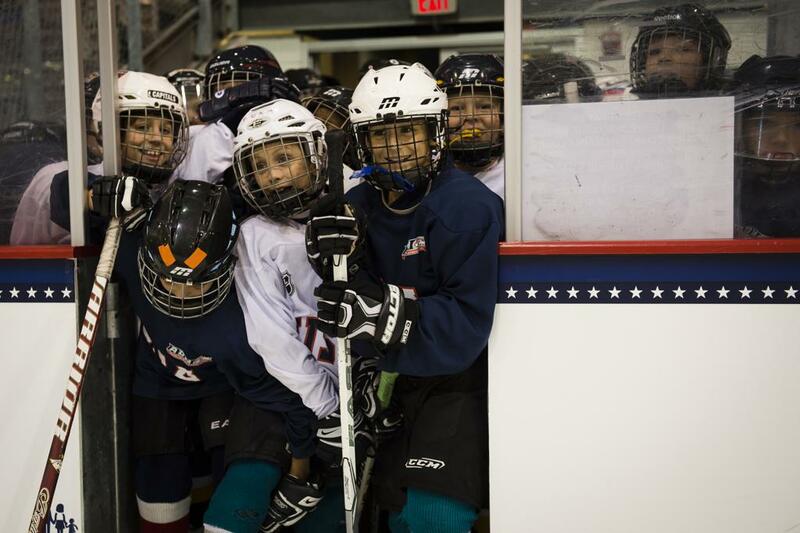 USA Hockey provides its associations with templates for on-ice curriculum for the events. One of the biggest initiative changes this year from USA Hockey is it will support associations that want to conduct Try Hockey for Free on any date during the year, rather than only on the nationally designated THFF Days. “We’re trying to be a little more flexible and open that door so people can use the tools and resources to hopefully keep that at the forefront of their minds during the course of the season as opposed to just two days out of the year,” Gibson said. Massachusetts Hockey Program Support Coordinator Mike DiOrio found the 2 and 2 Challenge information Gibson provided at the leadership conference invaluable to the association. Gibson also spoke to Massachusetts Hockey about Club Excellence. Launched three years ago, it’s a tool USA Hockey hopes every member association will utilize. Club Excellence is an online resource and blueprint to help youth hockey boards of directors and associations govern themselves; it’s based on a non-profit governance model. The tool came about in a roundabout fashion. Gibson said USA Hockey looked at its robust support and education tools for coaches and officials and decided to create something on a similar level for associations. Once registered, association officials are able to log onto an online portal that offers outlines of key positions within a non-profit board and gives duties and responsibilities of what’s expected in each position. Another big change this year is that, through Club Excellence, associations can create new positions specific to their association and create tasks tailored to them. “The idea is to help attract and retain more volunteers and give them tools to be successful,” Gibson said. Gibson is expecting Club Excellence to grow in the next year as more associations latch onto the tool. Adding the ability to customize positions with an association has been a major addition. The members from Massachusetts Hockey who heard Gibson speak at the conference found out how much USA Hockey is backing its associations. DiOrio said with USA Hockey’s support, the individual organizations should flourish. Lead all communications, including media and public relations, associated with USA Hockey’s National Team Development Program and USA Hockey Arena.